A relatively tame Thanksgiving weekend sees three new films competing for business over the extended holiday. As befitting the holiday theme, the family-targeted film is the one expected to have the biggest impact, with the other two likely falling behind even films from a couple weeks ago. 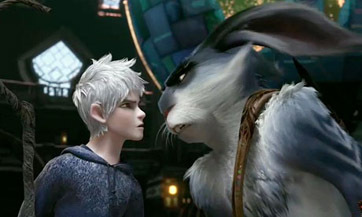 DreamWorks Animation gets back into the Thanksgiving market with Rise of the Guardians, which collects all the childhood legends, Santa Claus, the Tooth Fairy, the Easter Bunny, the Sandman and Jack Frost (or their Mexican non-union equivalents) and puts them into battle against what we might as well call the Boogeyman for the film's purposes. With the fate of children's dreams at stake, these five misfit, mismatched heroes must put aside their differences to... what do you mean, “Marvel Comics on Line 2”? So yeah, it's pretty much a pre-teen version of The Avengers, and has a high profile cast to match the heroes involved. Alec Baldwin, Hugh Jackman, Isla Fisher, Chris Pine and Jude Law make up the cast that's meant to convince the adults out there that this film will be worth their while, with the bright scenery and famous characters working on the kids. Usually these films are focused on comedy, so an action-adventure film is a bit of a departure. It's not totally unprecedented, particularly with The Incredibles, but that film had the Pixar brand. The DreamWorks brand is strong, but not that strong, and it certainly can't hope to bump Guardians up to that level just on the strength of it. Luckily, then, it appears to actually be pretty good, if not up to the (non-Cars) spectacular Pixar standard. Will some families judge it to be a bit too much for their kids to handle? Undoubtedly. But might it open up the audience to a bit older group, a la Polar Express? Seems like a good bet too. And it doesn't even have that creepy mo-cap animation. I put this in line with the typical opening of the second-tier animated releases of late, opening to about $45 million, or $65 million over five days.